Under newly relaxed regulations governing travel to Cuba, Cuba Cruise is offering Americans seven-night trips that circumnavigate the island. In the past, American passengers had to book lengthier land-and-sea itineraries with a sanctioned American tour operator. 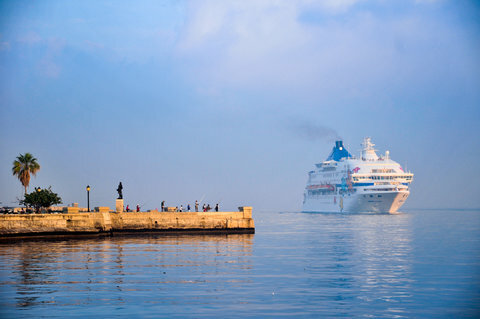 Now securing passage aboard the 1,200-passenger Louis Cristal involves reserving the trip with Cuba Cruise, a Canadian company, and registering for a People-to-People Program with the Fund for Reconciliation and Development, an American nonprofit. The organization then issues a participant letter authorizing travel. Sailors can embark in Montego Bay, Jamaica, or in Havana for trips that include visits to six Unesco World Heritage Sites in and around Santiago de Cuba, Cienfuegos and the capital. Americans are limited to educational shore excursions, all of which are optional, including visits to Fidel Castro’s birthplace, the mountains of Baconao Park, the Spanish colonial city of Trinidad and Havana via a vintage auto. The cruises run through March and will resume in December. They start at 782 Canadian dollars a person, or $637.50 at 1.22 Canadian to the U.S. dollar, plus port fees (178 Canadian dollars) and the cost of registration ($75), excluding airfare.